Yes, We Really Did Go to the Moon! ALERT! This page is basically a list of links to websites that either support or refute the claim that NASA never sent men to the Moon. I have my own detailed rebuttal of the Fox television program ``Conspiracy Theory: Did We Land On The Moon?'' in my Bad TV section. 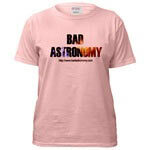 Sometimes, I think I have heard everything when it comes to Bad Astronomy. Then something comes along so strikingly nuts that I have to wonder what still lies ahead! In this case, the craziness involves people who think that the NASA Apollo Moon missions were faked. There are lots of rumors spreading around about this, and rest assured they are all completely false. The claims made by these conspiracy theorists are actually all wrong, and some are laughably so. Some involve some subtle (but understandable!) physics, while others are easily shown to be false. I plan on having a thorough debunking of this on this site eventually. This is a large undertaking because of the sheer number of the claims, so I don't plan on having it done anytime soon. However, the number of emails I have received has prompted me to set up this page as a stopgap measure. Below are listed pages by both the conspiracy theorists and the debunkers. Although not every claim by the conspiracy theorists is covered by the debunkers, you'll see that many of their major claims are, making it pretty clear that the lesser claims are bogus too. My own page rebutting the Fox TV "documentary". A page like mine debunking the Fox show, with strong emphasis on the rocks brought back. New (added November 11, 2002: I don't know how I missed this one so long!) A very thorough debunking of the hoax theory was written by Robert A. Braeunig. John Pike of Global Security was interviewed on NBC's Today Show about the hoax, and has a transcript of the show on his site. You can also go to the Today Show webpage about the segment. A great page by NASA geologist (and my friend) Paul Lowman, showing just why the lunar samples returned from Apollo are indeed from the Moon. Some details about various hoax arguments are debunked on Keith Mayes' website. He has lots of other good pages too, and scores major points with me for saying that centrifugal force is real. While not exactly a debunking site, astronomer Dan Durda put together a nifty series of pages where you can explore the Apollo landing sites, zooming in until you see a map of the area where the astronauts landed. Regular readers know Dan is an old friend of mine too. A page about the reality of Moon rocks by Steven Dutch, a professor of Natural and Applied Sciences at the University of Wisconsin-Green Bay. www.clavius.org is a very nicely done website with more specific debunking of the hoax. Ian Goddard's website has terrific images showing how many of the claims by the conspiracy theorists are wrong. A website debunking Bart Sibrel's video "A Funny Thing Happened on the Way to the Moon". A page that I think is a debunking page. It's in Russian, and the author assures me its by the Good Guys. Incidentally, since a Russian posted it, that makes it a bit harder to push the whole angle that this is a NASA conspiracy. My good friend Erik Max Francis has a vast site of conspiracies called Crank.net, and it has many sites listed. Bart Sibrel's website with a "smoking gun" video proving we never went to the Moon... sold for a price. Surprise! The Disinformation website has a long list of other lunar conspiracy theory sites. This one is just... weird. Yahoo! lists several other pages.